If you are short of time, the answers to the following 3 questions should let you know all you need to about the Genius Pro 8000 electric toothbrush. If we have missed something, let us know in the comments. If you want more detail, you can read the full review Oral-B Genius Pro 8000 Review further down the page or watch our review video. No, you can’t really ask for much more of an electric toothbrush — we actually rate it as the best Oral-B electric toothbrush. It cleans the teeth well, it offers multiple cleaning modes a great travel case and is packed within innovative technology. The Genius Pro 8000 is the most premium brush available from the brand at the time of reviewing. The downsides really are that the position tracking is still a bit too buggy given how heavily it is promoted. We have given a rating of 5/5 to the Genius Pro 8000 for pushing the boundaries in what may be considered a bit of a boring and practical industry. It has its imperfections but worthy of the score given the way it promotes great oral health. Oral-B have recently launched the Genius 9600, which you might think (by the model number) is a better brush. It is essentially identical to the 8000, with a few box contents differences primarily. We still believe the 8000 is the better buy. Aside from this 9600, alternatives are either from a competing brand, or a lesser featured model in the range. The Pro 6000 is the next brush in the range worth considering. A bit cheaper, it ditches the position detection system and the smart travel case. Alternatively you should look at the Sonicare DiamondClean Smart. Similarly featured, it costs a bit more but has a touch more class to the fit, finish and overall design. You may also be aware of a Genius 9000, which because of its higher model number seems like a superior brush. That is not the case, though. The Genius 9000 is a European model, in the US the Genius Pro 8000 is the top model and the brush to go for. We explain this in more detail in our Oral-B Genius Pro 8000 vs 9000 vs 89000 post . 3. Where is the best place to buy the Genius 8000? A wide variety of stores sell Oral-B electric toothbrushes but fewer stock this premium Genius model. Typically we recommend Amazon because it is very competitive on price (cheapest at time of review) and often has special offers running more frequently than others. It also offers free delivery. Nonetheless it is always worth checking out other retailers as well – we have included a live price comparison below, and it’s always worth checking out eBay. A couple of years ago the electric toothbrush market was shown some serious innovation with the Pro 7000. Pushing the boundaries of what should be expected from a toothbrush it brought Bluetooth connectivity a technology once reserved for smartphones and premium electrical equipment. Through intelligent sensors it became possible to log and track teeth cleaning performance. Many questioned the need for such. Would people use it? Does it really help? To a point, we still do here at Electric Teeth. Well 2 years on and around 1 million downloads later, it is fair for Oral-B to say there is growing data to back up the need and justify the feature and convince them to develop this further. Now further advances have been made in the app, the technology and design, to bring the Genius Pro 8000 which further pushes and enhances what is possible and fitting of a 2017 lifestyle. Originally launched in just Black color, from October 2018, the Genius Pro 8000 is available in additional color choices. Features and specifications of the brush are the same, it is just the color of the front panel on the brush handle that changes along with the design on the travel case. Below you can find our Genius Pro 8000 Video Review. Design – Well constructed, with a solid and premium feel in the hand there are a couple of design niggles. Most notably a Black coloured brush handle being used with White coloured brush heads as well as no LED for the Daily Clean mode, yet one for every other mode. Proprietary connector – The travel case uses a proprietary mains adapter rather than a more universal and readily available option like micro USB. Thus you need to take this with you too when travelling. Price – This is not a cheap brush. It is the most premium so you are paying more for it and for many it may offer features that will never be used. No wireless smart guide – A great accessory available with the last generation Pro 7000. I think Oral-B have missed a trick here as I found this so useful. It does in part duplicate the app from your smartphone, but giving users choice would be nice. There are a variety of cleaning modes, 6 in fact, and it comes with a good box contents, pressure sensor, multiple brush heads a travel case and built in timer. One feature that is heavily talked about and marketed by Oral-B is their app and the Bluetooth connectivity this brush offers. It has been made available before but there have been significant improvements in the app and the technology built into the brush to have it work better. The app uses the front facing camera on your smartphone to track the actual position of the Genius Pro 8000 inside your mouth when in use. It takes this data and displays this on the smartphone screen, giving instant feedback to highlight and direct you to where you have missed and where you need to clean next. It is almost like having a dentist or hygienist looking over your shoulder saying good, bad, brush for longer, you missed a bit. As you might expect Oral-B know a thing to two about toothbrushes and have conducted many studies, with their Motion Tracking Study showing that up to 80% of people spend insufficient time brushing in at least one zone of their mouth and 60% of people either didn’t brush their back molars at all, or spent insufficient time brushing them, so you can see why the position detection technology exists. Failing to brush your teeth properly can lead to all sorts of problems. It might start with a bit of swelling and inflammation and discomfort but over time this can get worse and require professional medical attention that can be painful and expensive. This new brushing system is designed to helps coach you and I to brush properly, in real time. Version 4.1 is the earliest version of the Oral-B app to support the Genius Pro 8000. The app will run on most Android or iOS devices. And uses Bluetooth on your phone and the Pro 8000 brush to pair. Your smartphone must have Bluetooth 4.0 as a minimum for compatibility. New for 2018, is the introduction of ‘Gum Protection Technology’ or ‘Gum Guard’ as it is also referred to as. Essentially, this is a software update to the smartphone app (available in version 6.0.1 of the app and above) that offers a special brushing journey, specifically designed to help improve your gum health over an 8 week period. Bleeding gums are usually a sign of gum disease, which in many cases can be treated with a good oral hygiene routine at home. The app is geared to help reduce and stop the bleeding of gums and help you turn your red, bleeding, sore and puffy gums to nice healthy pink, bleed free gums. You run though a series of screens, shown below that collect data and allow you or your dental professional to make custom adjustments to help achieve the end goal. Naturally, Oral-B recommend selected products to help get the job done, but over the 8 week period the app will monitor, encourage and help you work towards achieving those healthier gums. Setting up this Gum Guard mode within the app, does disable some other cleaning modes, but you can end what Oral-B call a journey at any point, if you like. Your gums might be in good shape, but other areas of the mouth might need attention, this is where the Professional Guidance feature allows you and your dental professional to work together. Actually share and discuss improvement areas and have your dentist actually program into the app extra brushing time and adjustments to your cleaning modes in your app. 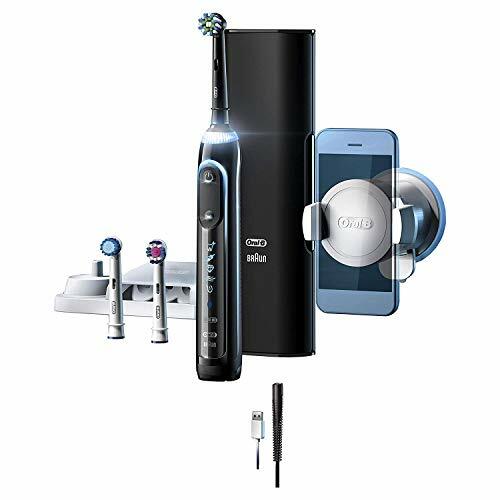 Of course the big part of this is the Position Detection Technology which uses the smartphone’s camera, the app and the brush to show on screen visually where you have and have not cleaned and shows you how to brush all zones in the mouth evenly and equally. Anyone of any age can use and learn from the feedback it gives. Online backup is another feature. With an Oral-B account you can never lose data and even share with compatible services for additional insights and benefits. As the app logs data over the days and weeks, it is impressive to see through the logs how your habits and brushing time changes. Whilst the holder has remained attached to my mirror and not fallen, I know many are concerned of it failing and an expensive smartphone being broken as a result. The universal holder has the Oral-B logo on it and an arm that can be adjusted to fit many smartphones of varying sizes from 58mm wide through to 83mm wide. If you are using a Samsung Galaxy S series or an Apple iPhone 6S Plus even, it will fit. There is then a full 360 degree rotation option. For some phones the button placement may interfere with the adjustable arms to do consider this when docking the phone. The particularly house proud may not like the holder on show, but for the sake of your teeth and oral health let go any reservations you may have about what the neighbours or family members may think about a smartphone holder in the bathroom. I am wondering if there is another solution? In my bathroom I ended up with the suction cup being sort of in the middle of the mirror which was a bit annoying, due to my height and the mirror position. There is also the fact that if you share this brush with others, although they may have the app on their phone and may need to change the placement of the suction cup, thus making it cumbersome and a lot of effort. There are silly quirks, like the smartphone holder having full tilt and swivel capabilities, but the phone must be perfectly upright for the position detection to track, making the holder mobility almost redundant. You need to be almost statute still for the app to track effectively. The good news is the brush store your clean history for the last 20 cleans so you can still retain a lot of data even if you do not use the app all that regularly. The best data will be for those who use the app all the time. If you are to look closely at the Genius Pro 8000 there have been seen some improvements in comparison to the Pro 7000 which it supersedes. Slimmed down a little in the profile to the older 7000, the Genius has a more uniform cylindrical body, similar to but larger than the handle size found on the Pro 100 and 3000. Solid and premium feeling in hand the brush is 24cm tall and around 3cm wide and deep and weighs in at 140g. The battery is fixed internally inside the handle and offers up to 12 days of battery life. Unlike the Pro 7000 and even the Pro 1000 the Genius Pro 8000 is available in Black colour only. The provided brush heads are white in colour as is the smartphone holder, yet the smart travel case is Black. Would it not make sense to have it all in Black? If nothing else a colour matched brush head?! This seems not to be any trouble for brands like Sonicare. I think it detracts from the overall design a little. I understand the smartphone holder being white as typically this is a common colour in a bathroom. Despite this small niggle the plastic and rubber construction of the brush feels and looks good. The plastic is resilient to the water, bacteria and toothpaste that it will come into contact with. A fully sealed brush it can be used in the shower, rinsed off under a tap etc without issue. Avoid complete immersion in water, its not designed to survive such treatment. The front of the brush has become a little busier compared to other brushes, but this is in my opinion a step in the right direction. Models like the 3000 have no way of clearly telling you which cleaning mode is active/selected but you can, sort of, with the 8000. Below this are icons for the different cleaning modes, well 5 of the 6 available anyway. Daily Clean, the default and go to cleaning mode has no icon. Why?! It is just odd and confusing as it looks like there are only 5 cleaning modes not the available 6. Press the power button once to power the brush on and press and hold for 2 seconds to turn the brush off. The button requires a firm push, meaning it is difficult to accidentally power on or off. To change the cleaning mode it is a case of pressing the cleaning mode button (downwards facing arrow) under the power button and continuing to press until the desired cleaning mode is reached and the indicator illuminated. Each cleaning mode is backlit with a white light when selected. Gone is the blue light as seen on the Pro 7000 and now it is white light. I preferred the blue, but white is probably more appealing to all users in general. To switch cleaning modes you must have the brush powered on and cannot press the cleaning mode button to cycle through them before powering the brush on. I see why this is but to clearly change mode you need to look at the handle and really need to do this before applying toothpaste and water to the brush head. On the rear of the brush is a contoured rubber grip which assists when holding the brush for grip, especially when wet. On the neck of the brush is where you find the LED SmartRing which will illuminate red when the pressure sensor in the brush is activated and will at other times (when powered on) shine one of 12 different colours set by you through the Oral-B app. This sensor looks to reduce and stop gum and tissue abrasions that are caused by excessive pressure application when brushing the teeth. A fairly gentle glide across the tooth surfaces is all that is needed, with some manual brush users applying up to 2 times the amount of required pressure. The brush will automatically reduce the head speed and stop the pulsation until the pressure is reduced. Trippe detection and alerts should quickly make you aware when you are brushing too hard. There is the pressure sensor light, the sound of the motor and the messag within the app to tell you to change that rushing approach. Although not new to Oral-B toothbrushes, a noteworthy and easily overlooked design feature is the rounded brush head. Small and compact you can generally get the brush head into all the hard to reach areas of the mouth, which is not as possible with some other brush heads shaped differently. The brush heads provided with the Genius Pro 8000, use an oscillating rotating and pulsating motion as shown in the following animated image. 3 brush heads are supplied with the Genius Pro 8000. They are just 3 or a larger range of available heads. The interchangeable design makes it easy to swap them out every 3 months or when you want to use a specific head for a specific cleaning mode (although any cleaning mode can be used with any brush head). We cover all of these in more detail in this post on Oral-B cleaning modes. All these modes, with the exception of Pro Clean are standard cleaning modes found on previous/other Oral-B models, although not all have every mode. The Pro-Clean mode replaces what was known as Deep Clean mode that is available on the Pro 7000. Pro-Clean provides an intense clean feeling with 3,000 more movements per minute than the more standard Daily Clean mode. You can choose any cleaning mode you like based on your preference. Typically the cleaning modes last for 2 minutes each and this ties in with what is recommended by dentists. There is a built in timer which has 2 modes, the standard 2 minute or professional. With the professional mode (came preset out of the box) the quadpacer on the 8000 kicks in. A short stuttering sound and flashing light of the Smart Ring at 30 second intervals takes place to alert you to move to the next quadrant of your mouth. A long stuttering sound and flashing light indicates the end of the professionally recommended 2 minute clean. You can change which timer profile you have enabled by following the direction in the manual. There is no denying my teeth always feel cleaner with an electric toothbrush clean than that of a manual brush and the Genius will remove up to 100% more plaque than a manual brush. Just as important as actually cleaning twice a day for 2 minutes is how you clean the teeth. Follow this guide for the best approach to deliver the most effective results. Included in the box with the Genius is a charging stand, but also a moulded piece of plastic complete with a lid which offers a home to 4 additional brush heads. This protects them from dirt and dust and vies a safe place to keep them. Ideal if you use different brush heads or have brush heads for different users. The charging stand fits alongside this brush head storage compartment for a neat arrangement on a shelf or work surface. The charger connects to the socket and supports 110-130v. The travel case included with the Genius Pro 8000 is branded and can be considered smart. Rather than a cheap yet functional piece of moulded plastic, the travel case here is much more capable. Larger than I expected the case is well designed and colour matched to the brush. Soft touch material all round, a large plastic release button to open it up with gloss plastic end caps to the case. Containing a USB connectivity this case not only allows the 8000 and up to 2 brush heads to be protected during travel, it also allows the brush to be charged in the case. This means you do not need to take the charging dock with you if you feel you will need to charge your brush whilst travelling. In the box comes a multi-voltage (100-240v) power adapter which connects to the proprietary port on the case and charges the Genius Pro 8000. Connect the USB charge cable for your smartphone to it and you can not only charge the brush but your phone too, when the mains power adapter is connected to the case. You may think why or how silly, but this means if going away you need to take 1 power adapter and a USB cable rather than 2 power adapters and a docking station. Thumbs up all round from us here at Electric Teeth. If we were to get critical this isn’t a great way to charge your phone up fast, but ideal for overnight and a great reminder to use the Oral-B app (as if you would forget)! And when you do use the app, the case cover actually has a clip designed to hold your smartphone in place too! Pretty nifty. If you phone is no thicker than 12mm. It would have also been great if the case used a more standard Micro USB charger, rather than a proprietary connector. This would mean that if you misplaced your Oral-B power adapter it would be easy to find an alternative. I do also think the 2 pin configuration is misjudged considering it is more likely that you will charge the brush via traditional sockets when travelling than from the standard shaver socket. We should also be clear in that there is no battery built into the case it will not charge the brush handle unless mains power is connected. An accessory I loved that comes provided with the Pro 7000 but not the Genius is the Smart Wireless Guide. Essentially a portable clock and timer that shows your cleaning mode, how well you are brushing (via a smiley or sad face and star rating) and how long you have been brushing for. Powered by 2 AA batteries it could sit on a shelf or attach to a wall with an adhesive pad and was a small unobtrusive addition to the kit that worked well. It does nothing more than what the app does, but I believe a very convenient solution to encourage better cleaning when the app is not in use. Sadly it is not included with the Genius. As a moulded brush with a virtually all in one design, maintenance is not simple on this brush other than a rinse and a wipe. However it should not really be required. Should something go wrong, there is as standard a 24 month warranty is provided with the Genius Pro 8000. This covers the battery too. Personally I see battery life to be an important factor when it comes to choosing a toothbrush, preferably I want it to last as long as possible without needing a charge. However, 95% of the time my brush lives at home within close range of the charging stand and there is no reason why it could not be charged more frequently. You may have a different opinion, but with up to 12 days battery life the Genius Pro 8000 is better than the likes of the Pro 1000 or 3000 by 5 days, but still falls short of the 2-3 week battery life offered by Sonicare brushes. A clever feature which does save power and potentially assists with the cleaning time is that on a Philips or Colgate brush, the brush motor will switch itself off at the end of the clean whereas a Genius series from Oral B will not do this. Is this because by not turning off encourages longer cleaning sessions? Turning it off automatically would save power and better alert the user to the end of the clean. If using the standard 2 minute daily clean twice a day, the Genius Pro 8000 will give 24 toothbrushing sessions or 48 minutes of cleaning time. Using certain modes will deplete the battery faster, whilst modes like the tongue cleaner are shorter and use less power, so the 48 minutes is a guide. I think irrespective of your viewpoint on battery life Oral-B have tried to cover all bases here. The built in battery within the handle of the Genius Pro 8000 is of a lithium-ion construction, a newer battery technology than the Nickel Metal Hydride that has been used in previous models. Giving extended usage time, the battery should also stand the test of time longer as this battery makeup handles repeated charges better. For those who are still underwhelmed by the life of the battery charging is made fairly easy. Included in the box is the more traditional charging stand that you can leave the Genius Pro 8000 sat on when not in use if you want. The charging dock itself is white in colour and has a small prong on the top which aligns with a recess in the bottom of the brush handle and will charge the brush fully in about 8-12 hours. I tend to leave it on charge overnight. When charging the battery charging icon pulses with a white light. Another small criticism is that you never know quite how much power is left, is it 20%, 15%. The battery status icons flashes when low. The flashing helps but a percentage guide would be useful, but I have yet to see a brush that offers this. I would have thought that the partnership with the app would have allowed this. For the travellers, there is the inclusion of the smart travel case too, which has a proprietary charger but does allow the brush to be charged in the case. That case also has a USB port on it, into which you can connect a USB cable to charge items like your phone. So when travelling you take the charger for the case and just the USB cable for your smartphone and from just one socket you can now charge 2 items. Personally I would have preferred it if the charging case itself used a more standard connector like microUSB or USB Type-C, or if the case could charge via a USB port on a computer like Sonicare DiamondClean models do, but maybe I am being a bit picky.The 2 pin adapter on the charger will connect to your normal sockets and supports 110-130v.The charger for the smart travel case supports 100-240v. We have included a live price comparison for the Genius Pro 8000 here. The Genius Pro 8000 has a recommended retail price of $199–250. This is similar to the older Pro 7000 which is now available for around $120.I would strongly advise not to pay the full price for the brush. You do not need to be some clever shopper to find it much cheaper. Just a few weeks after launch is is already cheaper by some 30%. We purchased ours for just $165. About $45 more than the Pro 7000, it is difficult to really say this is worth the extra spend for all users. Frequent travellers will find the inclusion of the smart travel case really appealing and the design and battery life is better, and for this reason we rate it as one of the best electric toothbrushes for travel. Over the coming years the price will likely drop nearer to the $100 mark but for the foreseeable future it is unlikely to drop below the $150 unless there is a particular promotion running. We found that most retailers were a it above the $165 mark with just a couple asking the full $250. I don’t think it is worth paying the full $250, the value is not present in my mind. Just be sure to shop around to make sure you get the deal you are happy with as this is just my opinion. This brush like every other requires replacement brush heads for each user every 3 months. Replacement heads can be purchased in packs of 2, 3, 4 and 5. The prices vary but are on average around $6-$8 per brush head included. The pack of 3 heads often works out cheapest at about $18-20 per pack. We like to offer up a figure for what we believe to be an average cost of ownership of this toothbrush. Using the average cost (based on one user) and ownership over 3 years, the Genius Pro 8000 will cost $242 or just $0.22 per day to own. If the Genius Pro 8000 was purchased at the full $250 price you would be looking at $327 or $0.30 per day to own. This price does exclude the cost of water, toothpaste and electric to charge it, but you get a rough idea of what it costs to own the very best electric toothbrush. If cost is a big factor, the Pro 7000 is a consideration which works out at $190 or $0.17 cents per day to own. Older Pro 7000 is quite a bit cheaper at $0.17 per day. When spending your hard earned dollars you want to ensure that what you are buying is going to last and you will get the value from it. We would not be doing you justice if it was not a standard procedure for us to thoroughly test each electric toothbrush we review here at Electric Teeth HQ. The Genius Pro 8000 is no exception. Weaknesses or vulnerabilities are often noticed from an early stage and on the whole electric toothbrushes from premium brands like Oral-B are well made and reliable. Of course some can go wrong, but there are usually covered under warranty. With years of experience behind them, the Oral-B team have designed the 8000 to be just as good if not better than brushes of the past. I have studied the Genius and there are no obvious places or reasons for this brush to fail or suffer long term. The Black colour rubber does not show the muck and dirt quite like some other models but it does show things like white fluff or dust more obviously than other models. The Genius is a brush that will be undergoing a long term test with us here at Electric Teeth and should we have any issues or find any reason to question the reliability as we use it over a longer period than we have for the purpose of this review, we will report back and update where necessary. Generally speaking the the weakest point is the battery. After repeated charges and discharges it can fail and should it, they are not easy to replace. Thankfully the lithium-ion battery technology now used in the 8000 is a step up over the old battery technology and should further improve long term reliability from the internal power source. You should get in the routine of depleting and recharging the battery regularly to reduce the chances of failure. The introduction of the smart travel case and smartphone holder offer up potential extra failure points, but to date they have both performed well. The included 2 year warranty offers peace of mind should something go wrong. The Genius Pro 8000 (view on Amazon) is an excellent toothbrush. It is not without its faults, but when charging this sort of price you have to be critical and compare it to the competition. As I see it whilst Philips Sonicare offer products similar, none match feature and box contents wise to the 8000 for the price. The biggest competitor to the 8000 is the Pro 7000 which in some ways the 8000 replaces. A lower price point and the inclusion of a Smart Wireless Guide are 2 incentives to opt for that. But a more polished design and the included smart travel case sway the odds back to the 8000. Box contents aside a brush has to do a good job of cleaning the teeth and there is no denying that the 3D movement of the brush heads and the power delivery coupled with different cleaning modes and the app help you and I as users achieve our oral health care goals and goes a long way to ensuring our dentist is proud of our efforts. The Genius Pro 8000 is the flagship model, it is like the Ferrari to the toothbrush world. It has all the bells and whistles, which some may not need or desire. You can get a perfectly functional brush for a lot less but still gain many of the benefits. However, in what may be considered a bit of a boring and practical industry, the Genius Pro 8000 represents innovation, the future and is a product fitting of the technologically developed world that we live in. It pushes the boundaries to not only deliver an exceptional clean but enhance and improve the experience that goes with it. Want to save a few pounds but still want something decent? Pick up the Pro 7000. If money is not really an issue and you want the best or you want the flexibility of travel and to really take the time to improve your oral health, opt for the Genius Pro 8000. Is the Genius Pro 8000 an oscillating brush? What is Tongue Cleaning mode? A gentle mode to be used on the tongue surfaces and the inner cheeks to help remove bacteria that would not be removed through a normal teeth cleaning routine. No, the Genius Pro 8000 has 6 cleaning modes. Daily Clean, Gum Care, Sensitive, Whitening, Pro-Clean and Tongue Cleaning. There are no other brushes from Oral-B or other brands that offer more. If you want less modes, the Pro 3000, or 10000 offer such. With the Genius Pro 8000 you get 3 brush heads included, a Cross Action, Sensitive and Pro White/3D White head. You can change the head with any others on offer from Oral-B. There are many that work with the brush handle. These options include Cross Action, Floss Action, Pro White/3D White, Sensitive, Precision Clean, Deep Sweep/TriZone, Dual Clean, Pro-Results, Power Tip and Ortho. Does the Genius Pro 8000 have a pressure sensor? Does the Genius Pro 8000 have Bluetooth? When using the Genius Pro 8000 CrossAction electric toothbrush, Position Detection unlocks enhanced features within the Oral-B App, including self-tracking, personal statistics, game mode, and encouragement to maintain good techniques, which all lead to helping you to brush like your dentist recommends and never missing a zone. Does the Genius Pro 8000 come with a warranty & how long is it? If purchased new from an approved retailer the Genius Pro 8000 will come with a 2 year warranty. Does the Genius Pro 8000 have a built in timer? No, the Genius Pro 8000 is designed to work with an app on your smartphone, pairing via Bluetooth and therefore does not have a wireless smart guide included in the box. Older models including the 2014 variant of the Pro 7000 offers this. That said, the Genius Pro 8000 does work with a wireless smart guide, if you have one. The Genius Pro 8000 charging station or brush head holder has not been designed to be fixed to a wall. Can I use the Genius Pro 8000 in the shower? The Smart Travel Case for the Genius Pro 8000 CrossAction electric toothbrush features a rigid, durable structure that can be placed vertically or horizontally for storage, and simplifies travel with your electronic toothbrush by enabling you to charge your brush and smartphone in one outlet at the same time. The inner cover includes a smartphone holder for optimal placement of your phone while using the the Oral-B App, allowing you to maintain the comfort of your at-home oral care routine while on the go. How long does the Genius Pro 8000 take to charge? The traditional charging stand supports voltages of 110-130v. Can the Genius Pro 8000 be charged via a USB cable? Is the Genius Pro 8000 quieter than other brushes? No the Genius Pro 8000 is quite loud and no quieter than any other Oral-B electric toothbrush. Will this work in Europe and when travelling? The black coloured charger for the smart travel case does support the European voltage’s up to 240v, but the white charging stand does not. You will need an adapter as although 2 PIN connectors are used in most of Europe it is a round pin rather than a flat pin configuration. Is the battery in the Genius Pro 8000 replaceable? Do you own or have you used the Oral-B Genius Pro 8000? What’s with the “Pro” in the nomenclature? I always thought it was just “Genius 9000” etc. Is there now a Genius Pro 9000? Was about to pull the trigger on a Genius 9000, I’m in Oz (Australia). The ‘Pro’ is short for Professional. It is just slightly different naming conventions that Oral-B use across the globe. The Genius Pro 8000 is for the USA and is essentially the Genius 9000 in other places of the world. The Genius 9000 is the best brush from Oral-B. No need to worry, not a new model.